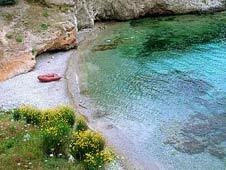 Kefalonia is the place where your stress level will drop and your enjoyment of life will rise. Economy - Investing in the expanding European Union is always a paying proposition. The Euro has proved a strong and vital currency, competing favorably with the US dollar and the British pound, and has also contributed to the stability of the Greek economy. Greece (Hellas) has one of the highest growth rates in Europe and, given its prospects, is anticipated to keep this position in the foreseeable future. It is also a natural destination for holiday homes. With the lowest crime rate in Europe, Greece is very safe. There are no "no-go" areas at any time of the day or night. Many Greek islands, including Kefalonia, have the lowest cost of living of all EU countries, and friendly and hospitable people who are ready to teach others how to enjoy the simple things in life. The natural environment and the great weather make it one of the best countries which to live. Buying Property in Greece - Greece is in the process of establishing a National Land Registry, whereby official titles shall be issued for the property and secured at the same time by the state. Some areas already have a Land Registry (such as Rhodes and Cyclades islands in general) while most others are based on a different system, that of the Registry of Mortgages on a Municipal basis. Kefalonia Homes & Villas will assist in the whole process of buying property in Kefalonia. We will be able to show you all our properties, recommend a number of reputable lawyers and notary public officers, and guide you through the whole process. Our duty is to ensure that the procedure for signing the contract deed is properly followed, and that you acquire a sound title to property. Construction - Kefalonia Homes & Villas employs its own architects, construction crew, and pool and landscaping specialists. The partners personally scrutinize every stage of the process, both in the office and daily on site, ensuring that only the very highest standards of workmanship are observed and the finest, state-of-the-art, materials used. It is upon this minute attention to detail, coupled with exceptional architectural designs, that Kefalonia Homes & Villas has built its powerful reputation. Property Management - Kefalonia Homes & Villas can arrange an after-sale service covering every aspect of household management and maintenance, including home servants, security, gardening and pool cleaning services. In essence, no effort is spared in meeting an owner’s specific requirements. Language - English is spoken by the young people in Kefalonia. Most people in Kefalonia will understand basic English even if they do not speak it. from London (Gatwick, Luton), Dublin, Manchester, Birmingham, Newcastle, Glasgow, Cardiff and East Midlands (May-Oct). from London (Heathrow, Gatwick, Luton) and Manchester, via Athens (year round). from Patras, Kyllini, Astakos, Ithaca (year round).